I was very impressed when I saw this sign today at the Lowry Park Zoo, although I hoped it hadn't been posted as the result of a child's allergic reaction! We didn't get to feed the fish, but the epi-pen stayed in its bag. Whenever I hear complaints about how essential safeguards for children with food allergies are an "inconvenience", I want to remind that person that none of us would survive our first day of life without the intervention of adults and that raising any child is both the biggest inconvenience and most important job many of us will ever have. Corporate responsibility, common decency, and safety for our children is not too much to ask. 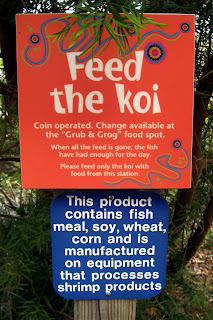 I think it's great to see the ingredient list on the koi food too - my daughter's been to a petting zoo where they have those dispensers all over the place for the animals. I've always been nervous about it and made her put the food in a small cup and shake it out for the animals. You just can't be too careful, huh? Hi gabs, thanks for stopping by. I keep being amazed by the places that allergens pop up. You're not paranoid if there really could be peanuts in the goat chow!